Join a Nationwide #PengyouDay Celebration of US-China Exchange and Friendship! On November 16th during the State Department’s International Education Week (IEW), Project Pengyou Chapters and Asia Society Confucius Classrooms across the U.S. will hold events and dialogue to encourage US-China study, engagement and friendship. 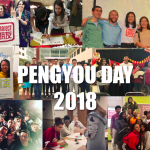 We’re excited that Asia Society, the Hopkins-Nanjing Center, the Fulbright Program and the US-China Strong Foundation have also joined us as partners to spread the #PengyouDay campaign in their national networks this year! We hope that Pengyou Day will inspire young leaders to seek common ground not only between cultures but also within their own communities as they consider what friendship and bridge-building truly mean to them. Join us on Nov. 16th to build people-to-people ties and spread hope on #PengyouDay! SHARE A PHOTO together with your American & international friends. Post it on Instagram, Twitter, or Facebook on 11/16 and include the message “Happy #PengyouDay! #IEW2016”. TEACH THE WORD “PENGYOU” or any Chinese word or phrase to a friend, relative, or anyone and POST A PHOTO on 11/16 of your friend on Instagram, Twitter, or Facebook with the following sentence “I taught (name of person) (word taught) in Chinese! Happy #PENGYOUDAY #IEW2017″. START A CONVERSATION with someone different than you. Teach them a word in Chinese, share your stories from abroad and listen to their cross-cultural stories. You never know, you might make a new pengyou! Post about it online on 11/16 and include the message “Happy #PengyouDay! #IEW2017”. ATTEND A #PENGYOUDAY EVENT on 11/16 hosted by Project Pengyou Chapters or even hold your own! Take this chance to create a space for intercultural dialogue that deepens understanding across communities. 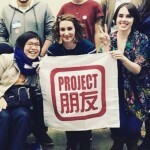 For more information, go to projectpengyou.org/pengyouday.